Pencils Down, Pass the Remote: What's the greatest Simpsons episode? What's the greatest Simpsons episode? Tonight, The Simpsons will air "At Long Last Leave," the groundbreaking series 500th (!) episode. While there are those who argue that the show should have bowed out years ago, the 500-episode milestone is an undoubtedly impressive accomplishment that has inspired anyone and everyone to reflect on the series. While some writers - like The Guardian's Euan Ferguson - have written about the elements that make The Simpsons great, the majority have gone the route of choosing a favorite episode (or episodes) and situating it within the context of the series as a whole. One of the most remarkable things about reading these pieces is the sheer variety of picks. Andrew Farago at the Washington Post chose the heartfelt second-season outing "Lisa's Substitute," while HitFix's Alan Sepinwall went with the fourth season's "Homer the Heretic." Both Hank Azaria and Time's James Poniewozik chose the darkly satiric "Homer's Enemy," which aired in the eight season, and Entertainment Weekly's Dan Snierson picked season four's "Duffless." USA Today went straight to the source, asking creators Matt Groening and James L. Brooks and producers Al Jean, Mike Reiss, David Mirkin, Josh Weinstein and Mike Scully to list their favorite episodes, and there was surprisingly little overlap, with only three episodes making an appearance on more than one list: Brooks and Mirkin included the satiric two-parter "Who Shot Mr. Burns?" (seasons six and seven), while Brooks and Jean both chose the series' pilot, "Simpsons Roasting on an Open Fire," and Jean and Groening both nodded to the current season's "Holidays of Future Passed." The disparity of opinions is due not just to the number of episodes that have aired, but also the many different tones the show has taken over the course of its run. Episodes like "Lisa's Substitute," "Holidays of Future Passed" and "Simpsons Roasting on an Open Fire" are heartfelt, family centric outings. "Duffless" and "Homer the Heretic" are stuffed with hilarious gags and over-the-top setpieces. "Who Shot Mr. Burns?" is a sharply satiric pop-culture parody, and "Homer's Enemy" is a darkly comic exploration of stupidity triumphing over aptitude. The Simpsons has made use of an incredibly diverse range of styles and viewpoints over the years, but the fact that it remains recognizable is one of the series' greatest achievements. And yes, I am going to offer my choice for the best Simpsons episode of all time. The excessively long lead-up is just a way of saying that I had a really, really difficult time choosing just one of the 499 existing half-hours, and that I'm certainly not claiming that my pick is the alpha and omega of Simpsons episodes, because there are so many others that are just fantastic. Ultimately, my choice comes down the fact that I like my comedy with a undercurrent of both heart and darkness (probably the reason Community is my favorite sitcom). I also like Ferguson's analysis of the way The Simpsons frames the American Dream as, essentially, the right to be lazy and incompetent and still succeed. It's obviously a very British perspective, but its one of the reasons the show's sharp-edged early episodes still hold up, and it lays the groundwork for my choice: the seventh season's "Scenes from the Class Struggle in Springfield." I love this episode for a lot of reasons, but the image it presents of the American Dream is probably the most important and, ultimately, incredibly bittersweet. The way that the family's working-class principles (such as they are) fade as they ingratiate themselves with the country club is sharply observed, and the satire of class distinctions is equally witty. Ultimately, the family's American Dream isn't being rich - it's sharing a meal together at Krusty Burger, and that moment marks the ultimate statement of the working-class reality that defined the show (at least in the early seasons). The real reason the episode works, though, is because of its characterization of Marge. She is very much the unsung Simpson - being the voice of reason and the element that holds the family together means that she doesn't get a lot of opportunities to be funny, and her personal struggles are not given the attention the rest of the family gets. "Scenes from the Class Struggle in Springfield" offers a portrait of Marge that is heartfelt and very poignant at the same time. She's a stay-at-home mom in a working-class family who loves her kids and husband, but who would also like to be able to buy brand-name items and go to fancy parties. She's desperately insecure, which allows her better judgement to go out the window when praised, but she's also strong enough to recognize how much her family needs her, and to love them as they are. She's happy, but she's also trapped. "Scenes from the Class Struggle in Springfield" is attuned to the subtleties of gender differences, and the episode's gender politics drive the narrative of class struggle. None of these elements would make this a great Simpsons episode, however, if it weren't for the laughs. Many of the funniest elements come from Homer's newly realized talent for golf and Lisa's sudden obsession with horses, neither of which are groundbreaking, but which are both are very funny. 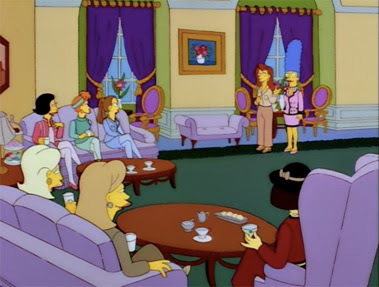 The family's attempts to fit in with the upper echelon of Springfield society are also hilarious, particularly Homer's plea to Marge to let him valet park their car: "Maybe for once, someone will call me 'sir' without making a scene" is a classic Homer quote. And the detail put into the rich "ladies who lunch," from names that would be normal if they were pronounced properly and the disguise of cutting insults as wit, is phenomenal. One of my favorite lines from any Simpsons episode, ever, is Susan's blase comment, "I hope she didn't take my attempt to destroy her too seriously." I'm sure, however, that everyone disagrees with me. That's one of the greatest things about The Simpsons; everyone has their favorites, and is willing to defend them to the death. So, in honor of tonight's milestone, think about your favorite Simpsons episode and, if you want, sound off in the comments!